Two enthusiastic interns and a grant from the Franklin D. Adams Fund of the Community Foundation of Greater Flint made a big difference this summer for one of MNA’s most popular nature sanctuaries, the Dauner Martin Nature Sanctuary in Fenton. Our time with MNA has proved to be a positive experience for both Ashlie and I. 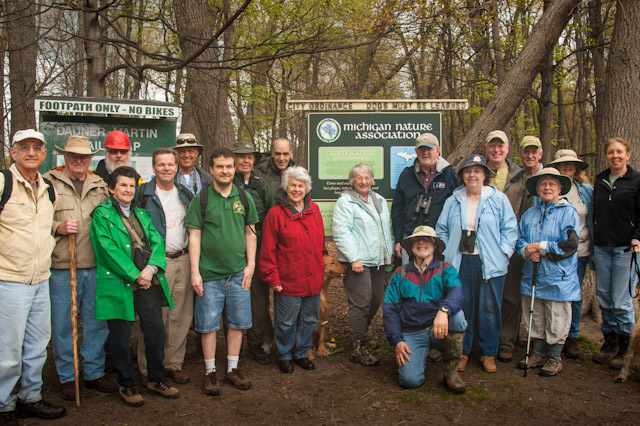 Neither of us could have imagined the positive reactions that we received from the volunteers, MNA staff and community members who recognized the work we accomplished in our time at Dauner Martin Nature Sanctuary. Ashlie and I came from different academic backgrounds but shared one common goal during the internship: to work hard and make the largest impact we could. Every day we gave our all and pushed through the never-ending wall of invasive shrubs that plagues the sanctuary. The most common of which was autumn olive. Dauner Martin was our home for the summer and offered many challenges. What Dauner Martin Nature Sanctuary lacks in rare species, it makes up for in the role it plays within the community. The sanctuary sits within a business district in Fenton, Michigan. This urban setting makes it a unique sanctuary for Michigan Nature Association and offers benefits and problems not found within their other properties. 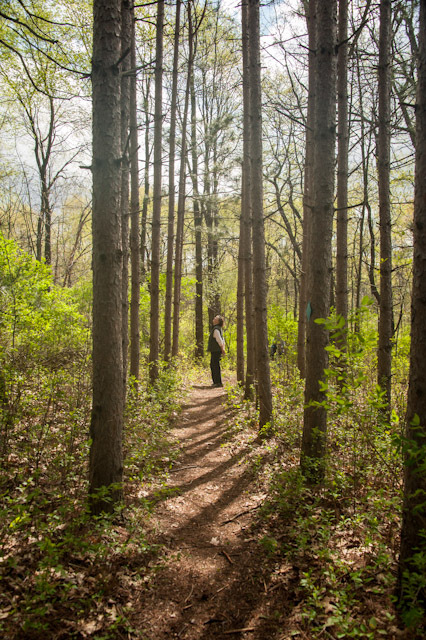 With two entrances into the sanctuary located close to a busy road, the roughly 4.5 miles of trails are frequented by Fenton’s local citizens. Having a 155-acre green space in a city offers many positives ecologically and for the community. Not only do visitors get to hike and enjoy the pine plantations, prairies, wetlands and hardwood forests offered by the sanctuary, it is also used by local organizations to help promote outdoor activities and an appreciation for nature. On the ecological side of things, the sanctuary also acts as a haven for an assortment of wildlife and promotes ground water recharge. Our common workday included a variety of activities. Trash clean up and trail maintenance was usually reserved for our down-time. We also installed a 1,700 square foot native garden which we hope will grow and flourish. But the majority of our time was spent cutting down invasive shrubs using power tools and treating the stumps with herbicide. After the shrubs were cut, we would haul the branches through the understory and stack them into piles. Overall we cleared over 10 acres performing these day-to-day activities. With the internship completed, Ashlie and I are headed back to school to finish our final two semesters before entering the workforce. I will be finishing my degree in Plant Biology at Michigan State University with the intention of working in habitat conservation and restoration. Ashlie intends to work with fisheries in the Upper Peninsula after completing her degree in Fisheries and Wildlife at the University of Michigan. As we look towards our futures, I speak for both of us when I say that we will always look back at our time at Dauner Martin fondly and I’m sure we’ll be back to see what improvements have been made to the sanctuary. We can’t thank MNA enough for giving us this experience and will use what we have learned as a platform, upon which we will build our future careers. Thank you Andrew and Ashlie for all of your hard work! The Dauner Martin Nature Sanctuary is MNA’s second most visited sanctuary. Situated within the Fenton city limits, it’s surrounded by people and development. Almost 5 miles of trails crisscross the 155 acre property. Several Eagle Scout projects have been completed here, helping provide easier access over wet areas. Lots of folks from near and far like to visit the sanctuary to enjoy the peaceful pine plantations, bird watch, walk their dogs (yes! this is one of a very few MNA sanctuaries that allow leashed dogs), study the wildflowers, or take in the sad beauty of our mighty open-grown ash tree that succumbed to the emerald ash borer and is slowly returning back to the earth. Dauner Martin is an oasis in an asphalt desert, and people love it! Unfortunately Dauner Martin receives a bit of abuse as well. Trash walks in and doesn’t walk back out, unleashed dogs threaten ground-nesting birds and frighten unsuspecting hikers, nighttime revelers decide it’s a good place to start a fire (at least one of which escaped, burning a portion of the sanctuary), and the benches, meant to create a space for rest and contemplation, spontaneously disappear. About this time last year, someone decided to test out their hatchet skills and felled on one of our young trees for no reason. In an effort to engage the community around Dauner Martin and to build a stronger, more positive presence at the sanctuary, MNA is forming a Friends of Dauner Martin group, and is seeking volunteer Ambassadors to serve as links to the community and to help on special projects. If you enjoy walking the trails, assisting with management, or talking with others about the sanctuary, you can attend a kick-off meeting on Wednesday October 2nd from 6-8pm at the Fenton Community Center. There, you can learn more about the sanctuary, get some training, and sign up for particular Ambassador positions. Please pass the word on to anyone that you think might be interested. Ambassadors are needed to walk the trails and report issues they see, communicate the rules of the sanctuary to visitors, help with management tasks such as invasive species removal, recruit additional volunteers, and answer questions from visitors. All levels of commitment are welcome. If you can’t make the meeting but would like to learn more, contact Katherine Hollins by email at khollins@michigannature.org or by phone at 517-525-2627. A Beautiful Day at Dauner Martin! While the day started off with soft showers, by the time we arrived at Dauner Martin the skies were clearing. The sun had come out and with it, a great group of hikers excited to be a part of the Odyssey! Paul and Sue McEwen did a fabulous job of spreading the word and were ready and waiting with their friend John Smith, who added so much to our day. John was exceedingly knowledgeable about the sanctuary and was able to identify many species in a very interesting and informative way. He also pointed out several butterflies to us including a tiger swallowtail, red admirals, and a comma butterfly. Some great photographers were also part of the group, with Marianne Glosenger of Empire looking forward to entering her photos in this year’s photo contest. Seeing some of her work on this trip, we know she will be a contender. Being a part of the Odyssey and meeting so many great people is what makes this such a special time; getting to know people along the trail and sharing the “ooohhhs” and “ahhhs” as we saw massive ash and cherry trees, the first swallowtail butterfly of the season, as well as just being a part of a perfect day. Photos of our day at Dauner Martin should be in the next issue of the Midweek Times, thanks to a staff photographer who shot some candids of the 21 people who helped make our day great. As we entered the 155-acre sanctuary in the city of Fenton, one of the first things that caught our eyes was a group of several small Ohio Buckeyes that were located only at the Dauner Road entrance. It soon became evident that the 4.5 miles of interconnected trails were very well marked and kept cleared by the great efforts of the stewards, and signage was strategically placed along the trails so that no one would lose their way. Several benches were located along the trails, some of which were made by Eagle Scouts; the scouts also constructed a very nice boardwalk over a wet area of the sanctuary. The major habitat of the sanctuary is second growth oak-hickory forest along with pine plantations and wet depressions. Several large trees were seen; notable were cherry trees, and a very large ash tree that had sadly been killed by the emerald ash borer. There were not a lot of spring wildflowers in bloom; however, we did see several species of violets as well as Jack-in-the-pulpits. Dave pointed out several moss-covered logs and decaying wood that were providing a habitat for mushrooms, part of a healthy forest ecosystem. Halfway through the hike Paul stopped to explain all the stewardship activities that were going on at the sanctuary including the many work days they have scheduled to remove invasive species. Paul and Sue invited everyone to come back to help on scheduled work days and be a part of future field trips. We know we want go back to Dauner Martin, and hope you will, too! Check out more photos from our visit to Dauner Martin on MNA’s Flickr page! If you’d like to join us on a future Odyssey tour, visit the MNA website.